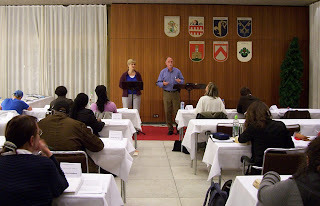 Last weekend we held a class at our mobile Bible Training Center in Bonn, the subject was "New Testament Literature". This is a class that I normally teach in our week-day school and in some of the mobile schools, but this time we did something different. 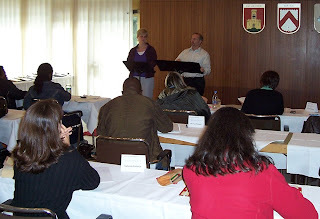 Another missionary, Mark Six, was in Bonn during this weekend so it was decided that he would teach this class. Mark was informed that I would be attending the class and because the class consists of 12 hours of teaching over two days, and because he would be speaking in our church on Sunday, I could do part of the class if he wanted me to. We ended up having Mark do the first six hours of the class and then I did the final six hours. Here are two pictures from the class, one with Mark Six teaching and the other of me teaching. Mark received a copy of my notes to help him prepare for the class and he did an excellent job not only covering the material but also by adding some of his own personal insights on the New Testament. It was different for me to have someone teach the first half of a class and then coming in to finish it but it worked out great. I personally enjoyed the teaching that Mark did and I heard from others in the class that they also benefited from his teaching as well as mine. With two different missionaries teaching in the same class the students had a unique opportunity to gain insight from both of us on the subject of the New Testament. Mark and his wife Robin have been missionaries in several countries for a number of years, and I actually met them both a few years ago. Previously they lived and ministered in Belgium and The Netherlands and a return trip to these two countries was why they were in Europe. Both Mark and Robin are graduates of RHEMA Bible Training Center in Tulsa, Oklahoma and they currently live and minister in Japan. 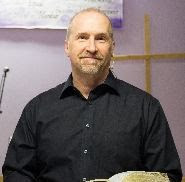 If you are interested in learning more about Mark and Robin Six and their ministry you can visit their website at http://www.desti-nations.org.